It was the Dutch Post-Impressionist painter Vincent van Gogh (1853 – 1890), who said: “What would life be if we had no courage to attempt anything?” Giancarlo Buzzi, a dedicated Arabian horse breeder in Italy, had the vision and courage to combine his excellent producing mare Anthea Moniscione with Van Gogh AM and bred a delicate piece of art: the filly Adila Moniscione. 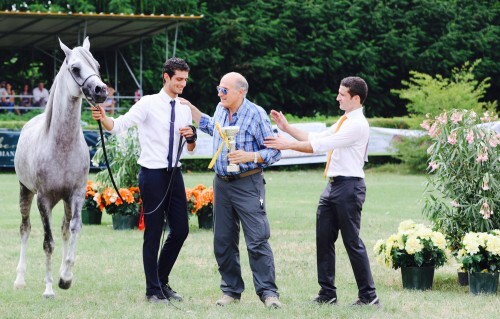 The Arabian Horse Event in Manerbio proved Giancarlo Buzzi’s decision right. Adila Moniscione was not only the Unanimous Gold Champion Yearling Filly but also the unanimous choice of the judges for Best In Show! The quality of Adila Moniscione is no incidence. The valuable blood of Padron can be found on both sides of Adila’s pedigree. Her sire Van Gogh AM represents the strong sire line of Padron through Magnum Psyche, while her dam Anthea Moniscione is by Padrons Ghibli. Angelo Boscarino says, the European show season for Shazin Arabian was good so far and that he cannot wait until a special filly, sired by Majd Moniscione, will come to Europe. The filly is already a gold medal champion in Saudi-Arabia and will be campaigned throughout Europe soon. Both, the Senior Champion Mare and Stallion were unanimous decisions, too. 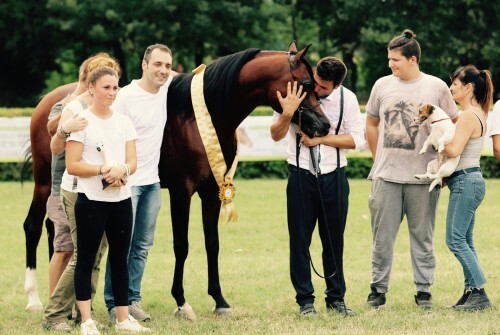 Giancarlo Buzzi is also the proud breeder of the Gold Champion Senior Mare Shakira DVA, who is a close relative to the Best In Show, Adila Moniscione. Shakira’s sire is Ajman Moniscione whose dam Anthea Moniscione is also the dam of Adila. Again we can see the influence of Padron in Shakira DVA. Not only through the wonderful producer Anthea Moniscione but also on the female side. Samara Al Tiglo, Shakira’s dam, offers two more crosses to Padron. The Gold Champion Senior Stallion is Jamil Ibn Shaklan P, bred and owned by Sencila Bled D.O.O. Jamil Ibn Shaklan P is a bay son of Shaklan Ibn Bengali, himself by the immortal FS Bengali; maybe the most successful stallion in the showring ever bred in Germany. Shaklan Ibn Bengali, out of the wonderful Spanish-Egyptian-bred LM Sadunga, was quite influential in Switzerland and left some fine get. On the female side of Jamil’s pedigree we see the Russian influence of Corall and the tail female line is tracing back to Murana 1808 through Jeszikah, who founded a family of champions in Germany in the 80s and 90s. Two brothers proved their courage; Enrico and Nicola Mearelli founded their Elegantica Training Center last December. “By the end of December we were completely booked out,” says Enrico Mearelli, who is obviously happy that all is going so well for him and his brother Nicola. “At the moment, we take care for 60 horses, which is quite a big number to run behind them. However, it is our passion! The European show season was okay, we already enjoyed some nice results for our clients. Manerbio turned out really good for our clients and us.” The two years old filly Petra D Argo, by Extreme El Aziz, bred by Miano Santi and owned by Balastro Eugenia Eleonora became Silver Champion Junior Filly, only bested by the EKS Alihandro daughter RK Andro. The junior colt championship brought even more success. Wadian, by Wadee Al Shaqab, turned out to be Bronze winner. He is bred by Husted Arabian, Sweden, and owned by Andrew Tabone. Elegantica Training Center also presented the Gold Champion Junior Colt with Omar Pasha, bred and owned by Koenraad Detailleur, Belgium. Thought the show was held at the hottest weekend this year so far it was a great event with an exciting atmosphere. Italians are an enthusiastic audience! A heartfelt thanks goes to the breeders, owners, trainers, riders and handlers and to all the generous sponsors, for inviting the Arabian Horse Global Network to Italy!